National Institute of Technology (NIT) Meghalaya invites applications from Indian nationals for appointment to the various positions listed below on permanent basis. 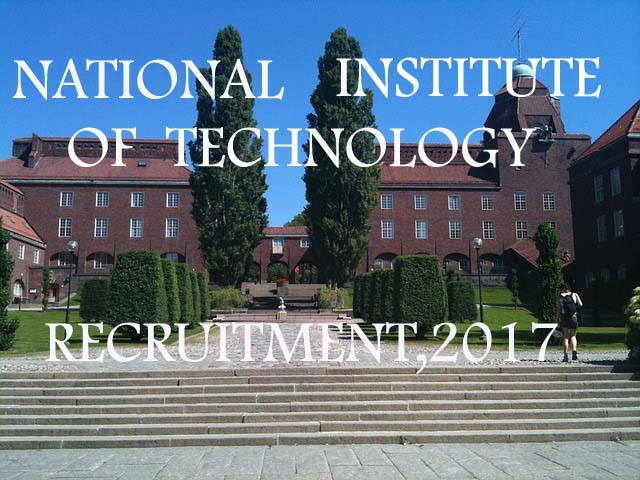 To apply for the NIT Meghalaya Recruitment 2017, you have to possess requisite academic qualifications and some experienc. Moreover you have the commitment to work and an inclination towards institutional development of NIT Meghalaya. 1. Post graduate degree in any discipline with at least 55% marks or its equivalent Grade „B‟ in the UGC 7 point scale from a recognized University / Institute with excellent academic record. 2. Experience of least 3 years at Grade Pay of `4800/- or higher in a reputed organisation. 3. Persons with Commerce or Finance background will be preferred for one of the posts. 1. Qualification in area of Management / Engineering / Law. 2. Proficient in handling computerized administration / legal / financial / establishment / academic matters. 3. A Chartered or Cost Accountant degree or diploma for the post of Assistant Registrar (Finance and Accounts). Master's Degree from a recognized University or Institute. Knowledge in use of Office Automation Software. 3. Technical Assistant (Computer Centre/ Civil) One post for each Dept. 2 years relevant experience. OR Bachelor‟s Degree in Engineering (Computer Science/Civil) from a recognized University /Institute. Bachelor‟s degree and proficiency in use of Office Automation Software. 1. Graduate in Library Science. 2. Experience of at least 2 years working in a Library. 1. Post Graduate Degree in Library Science. 1. Experience in Library Automation/ knowledge of computerization of Library. 1. ITI Certificate in Welder Trade. 2. This is a lass 10 passed job. The process of The Recruitment of NIT Meghalaya posts is offline. The filled-in application form OR the updated bio-data/CV should be addressed to the “Registrar (i/c), National Institute of Technology Meghalaya, Bijni Complex, Laitumkhrah, Shillong-793003”, in an envelope superscribing “APPLICATION FOR THE POST OF ………………………”. Applicants willing to apply for more than one post must send a separate application form for each of the posts. The number of positions may vary depending upon vacancies available and sanction received from MHRD. Applicant must write his / her name, address and the post applied for on the back side of the bank draft. Applications received with Demand Drafts without this information on the back will be summarily rejected. 1. Applicants for the post of Assistant Registrar must enclose details of all their qualifications and relevant experience along with self attested copies of all mark sheets, certificates, etc. 2. Applicants for other positions are NOT to enclose copies of mark sheets, certificates, etc. along with the application form. Applicants are advised to fill up the form completely and clearly. 3. Incomplete applications and applications not in the prescribed format will be summarily rejected. 4. Applicants are advised to give phone numbers and e-mail address in their own interest to facilitate prompt communication. 5. Applicants may attach additional sheet(s), wherever necessary, mentioning the serial number.